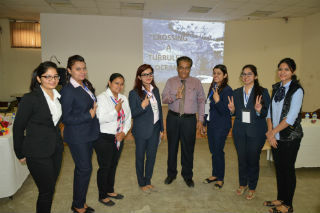 Workshop on Team Building, "Crossing A Turbulent Ocean"
A Workshop on Team Building, "Crossing A Turbulent Ocean" was organised for PGDM Students of second trimester all specializations on 19th Nov, 2016. 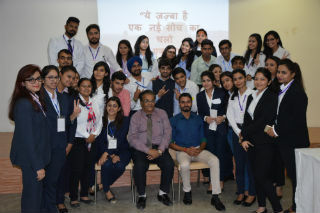 The workshop was planned, coordinated and put to actual process by the coordinators of Samanvay Club senior students of PGDM, HR. The Coordinating team of Shreya Bansal, Priya Sinha, Tanvi Katiyal, Priyanka Sharma along with Vaishali Gupta and Pooja Vats did the total work from planning to execution. To add colors and objectivity to the theme of workshop our alumnus Mr. Yuvraj Singh ( Batch 2010-12) JIMS was a key person among the team of Jury. The best part of the workshop was that out of 9 participating teams 5 teams scored bonus marks for punctuality, Coordination, Team Spirit and ability to take the decision in crisis. 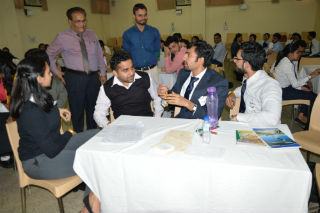 It was a scene to watch the participants were deeply engrossed in the problem solving typically like Indian Soldiers facing turbulent situations with limited resources yet achieving great results. The Top 3 Teams were awarded for their meritorious performance in the workshop. 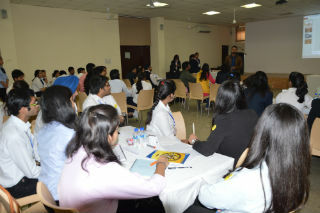 The top 3 teams were from PGDM IB and PGDM General. 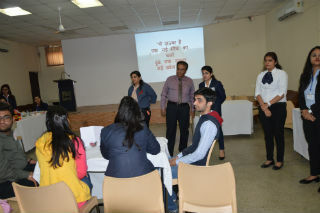 The budding leader with potential spotted in the workshop were from PGDM General ( Ajay Phougat, Radhika) PGDM - Retail. The winning teams were awarded prizes for performance declared and assessed by the jury comprising of PGDM (HR) seniors and our alumni Mr. Yuvraj Singh. 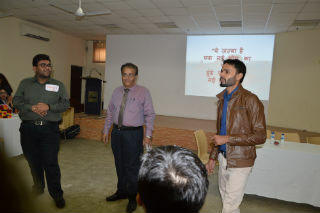 The workshop concept focus and overall input analytics and output thereof was conceived and designed under the mentorship of Prof. S.C. Kapoor and His DareDevils JIMS. The excitement among student was noticeable as vibrancy and enthusiasm was quite pronounced from 9:15AM to 3:00PM. Students would submit a write up on their experience and learning from the workshop next week for a review to enrich future inputs.